Starwood and Aeroplan have launched a new promotion for stays at their Four Points, Aloft, and Element Hotels brands across Canada this summer. The offer is for 1,000 Bonus Aeroplan Miles per stay. 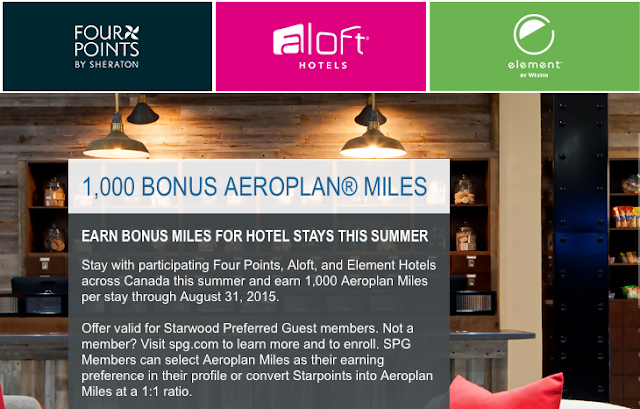 You must be an SPG member (free to join) and select airline direct deposit to Aeroplan to earn the bonus. It appears that pricing for this offer is the same as the Best Flexible rate so the bonus is a nice return if you are like me and don't book the cheaper prepaid non-refundable rates. AAA rates may be cheaper so you'll have to do the math and figure out if the 1,000 miles is worth more to you than the AAA discount. • Earn 20,000 bonus Starpoints® after you charge $500 in purchases to your Card in your first three months of Cardmembership.